Beovision 8800 marked a brand-new generation of televisions with significant technical improvements. One of the most important enhancements was probably the remote control, which now worked with infrared light instead of ultrasound, and had practically all the same functions we use today. Thus, it could also operate text-TV, a brand-new service offered to viewers, introduced in 1983. The remote control took on something of a cult status. Being cast in zinc, the remote control was much more pleasant to handle; as zinc conducts heat, you didn't get clammy hands from handling it for an extended period. Beovision 8800 had remarkable sound compared to other televisions. The engineers had managed to incorporate a built-in two-way loudspeaker system driven by a 14W amplifier. The energy consumption was only 75W, which is in fact on a par with today's standards. But, back then, a television used more energy if you turned up the volume or increased the picture contrast. These factors are no longer very significant. This system concept was new. It was now possible to use the same remote control for both the TV and the video recorder. Bang & Olufsen blazed new trails by fusing two remote control units into one. The technology should exist for the sake of people - not the other way around. This philosophy has been pervasive from the very beginning. And it is refreshed at regular intervals. For example, quoting a sales brochure from the 1970s asserts: "There is something that distinguishes Bang & Olufsen radically from everybody else. We are just as interested in what our products are used for as we are in their technological capabilities. To us, coming up with a technically satisfying design is not enough. It also needs to be satisfying to use. It should operate intuitively. Knobs, buttons and dials need to be positioned logically and consistently so they can be understood and operated by children and adults alike. This might make people think the technology is less advanced. Nothing could be further from the truth. On the contrary, well-thought-out operation makes heavy demands on ingenuity, often requiring unconventional, sometimes radical solutions. The objection is frequently heard that people quickly become accustomed to operating technical equipment even if it is complicated and illogical. We do not believe that this is necessarily so. In fact, people often find complicated things annoying - and give up trying to make sense of each of the functions they have paid for. There is simply no excuse for not thinking through the functions and their operation. Even when we're talking about the most advanced high-fidelity equipment, the technology is there for the sake of the people - and not the other way around." 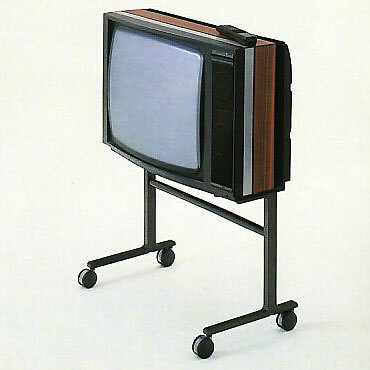 Beovision 8800 became a classic, remaining in production until the launch of the Beovision LX family. Start time	Approx. 5 sec.